Rep. Darrell Issa is aiming to launch investigations on everything from WikiLeaks to Fannie Mae to corruption in Afghanistan in the first few months of what promises to be a high-profile chairmanship of the top oversight committee in Congress. According to an outline of hearing topics obtained by POLITICO, the House Oversight and Government Reform Committee is also planning to investigate how regulation impacts job creation, the role of Fannie Mae and Freddie Mac in the foreclosure crisis, recalls at the Food and Drug Administration and the failure of the Financial Crisis Inquiry Commission to agree on the causes of the market meltdown. The sweeping and specific hearing agenda shows that Issa plans to cut a wide swath as chairman, latching onto hot-button issues that could make his committee the center of attention in the opening months of the 112th Congress. By grabbing such a wide portfolio – especially in national security matters – Issa is also laying down a marker of sorts, which could cement his panel as the go-to place for investigations. An order for hearings has not been set and witnesses have not yet been notified. The committee staff is still moving offices and subcommittees are currently being organized. Hearings aren’t likely to begin until late January or early February. Issa’s broad portfolio of investigations – some of which could target the Obama administration — harkens back to the days of Rep. Henry Waxman (D-Calif.), who squared off against the Bush administration, and Rep. Dan Burton (R-Ind. ), who picked fights with former President Bill Clinton’s White House. Just a few month ago, shortly before the midterm elections, Rep. Darrel Issa (R-Calif.) told Rush Limbaugh he considers President Obama “one of the most corrupt presidents in modern times.” Soon after, the Washington Post‘s Ruth Marcus noted, “If Issa believes this, he is deranged. If he doesn’t and is saying it anyway, he is dangerous.”A month later, pressed by ABC’s George Stephanopoulos, Issa walked it back. Yesterday, Issa returned to his original, deranged point, but broadened the scope. 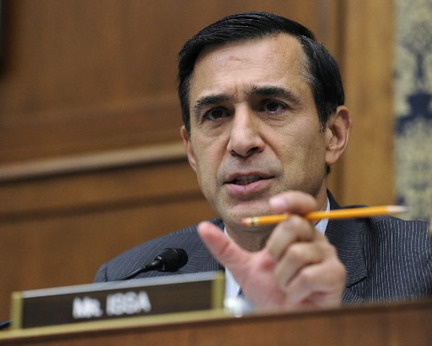 Rep. Darrell Issa said he meant to say the Obama administration instead of the president. Well, in that case, Issa seems entirely reasonable, right? How silly of me to think the right-wing Californian, perhaps best known as an alleged car thief who lied about his military background, might be less than sensible about his partisan hatred of the president. Is Issa really saying that the Obama Administration is on a par with the Nixon Administration, which included a Vice-President who was forced to resign over tax evasion, staffers who engaged in illegal activity associated with the 1972 Presidential campaign, and a President who participated in an effort to cover-up that activity and was then forced to resign himself ? If you listen to what he’s saying, it’s clear that Issa isn’t saying. As has become far too typical in modern politics, he’s using a word like “corrupt,” which to an ordinary person connotes criminal activity of some kind, to condemn policy differences he has with the Administration, and in the process he glosses over the fact that TARP was passed under a Republican President with significant support from Republican Congressman and Senators. It’s part of the general decline in political rhetoric that we’ve seen in this country, and it’s not at all a good sign for the next two years. The President may be wrong, but don’t call him corrupt unless you have actual evidence that crimes may have been committed. Issa clearly doesn’t have that evidence. It looks as though Issa plans to start on issues where he can get bipartisan consensus for probes and work on building some momentum. I’m a little surprised that Issa hasn’t included, even in that sense, a probe of the firing of Inspector General Gerald Walpin and the expanded use of “czars” by this administration. The termination of the IG for his opposition to a deal cut with an Obama ally amounts to a rebuke of Congress, which supposedly gave IGs job security so that they would do their work without fear of retribution from the executive branch. The “czars” also represent an end run in at least some cases around Congressional oversight. If a bipartisan consensus cannot be generated to protect Congress’ constitutional privileges, then perhaps bipartisanship in this context is overrated, and Issa should consider expanding his definition of “corruption” a little wider. Issa and his staff have done stellar work exposing corruption and malfeasance while in the minority. Will they be able to live up to the Drudge-headlined hype now that they’ve got subpoena powers? Rule #1 in politics: Manage expectations. It’s a smart rule not only for politicians in the limelight, but also for voters. Just a humble reminder: Issa’s job — and this goes for every GOP House leader — is not to mollify Beltway pundits. Their job is not to manage White House p.r. and “reach across the aisle” and “get things done” for the sake of bipartisanship. Their job is to protect taxpayers’ best interests, rein in a bloated, out-of-control federal government, and abide by their oaths of office.